One of the limiting factors affecting the length of horizontal wells has been the effective management of reservoir sweep with regards to wellbore influx. The added benefit of greater reservoir contact is met with increased differential drawdown across the well length and a greater tendency to cut across heterogeneous formations with varying permeability. For many years inflow control devices (ICDs) which restrict flow by creating additional pressure have been used to mitigate this problem. However, they are passive in nature and once installed cannot be adjusted. In the event of water or gas breaking through in an oil well the limitations of the passive ICD become evident as the well can be quickly overtaken by the breaking fluid. Autonomous ICDs (AICDs) are, however, self-regulating and are classed as active. Unlike their passive counterparts, which produce greater pressure drop for higher density fluids, AICDs, in addition to controlling oil influx, choke water and gas more readily. This prevents the well from being flooded when unwanted fluids break through, therefore providing the advantage of being able to even out inflow into the well and, in addition, choke compartments producing unwanted fluids leading to greater recovery, lower water cut and gas production. Integral to the effective implementation of AICD technology is optimisation of the device and integration into the reservoir completion. Tendeka has developed a comprehensive multi-phase flow model of the AICD performance and applies this to modelling its influence on inflow distribution in a completed well system. The model is validated by comparing results obtained with extensive testing in a multi-phase flow loop and actual field examples following the installation of more than 10,000 of the company’s AICDs in more than 50 wells globally. One type of AICD available in the industry uses a levitating disc shown in Figure 1 (below). The disc regulates flow based on the fact that a moving stream of fluid will experience a reduction in pressure. When stream velocity above the disc are high enough, the pressure drop generated will lift the disc and restrict the area available for flow thereby choking the flow. Since the velocity is different for fluids of different viscosities at the same inlet pressures, it chokes fluids of different viscosities differentially. A quality check of the design’s regression coefficients for gas control accuracy. The data is inputted into the design and simulator software to aid in the creation of an optimum AICD design. A unified approach to AICD modelling is paramount, and using the original equation proposed by the early adopters should be a first choice. Most AICD providers are able to provide performance curves, and as such should be able to port into existing or proposed simulation matrices. 1.Generate performance data for the specific AICD for the application using a mathematical model developed from empirical testing to present the data as flow rate, mixture density and viscosity and pressure drop. Perform multivariable non-linear regression on the dataset to determine optimum coefficient values. Linear regression can also be used by using a logarithmic relationship. Provide a simple table for a single unit AICD with the following parameters – see table below. Comparison with a passive ICD System. As a multitude of passive ICD systems exist in the market place, it is suggested that an equivalent fixed orifice with a discharge coefficient (Cd=0.85) should be used for ease of comparison. Figure 2 shows a comparison of an AICD versus a passive ICD where oil flow is matched at a desired pressure differential. In this example, the AICD provides water and gas choking 2-3 times better than a passive device. The net effect of this behavior should be studied over the life of the well. The main challenge for reservoir engineers is to have a meaningful adjustment of the AICD control strength over a simple passive ICD. The best way to optimize this is to alter the AICD coefficient by the number of valves used. 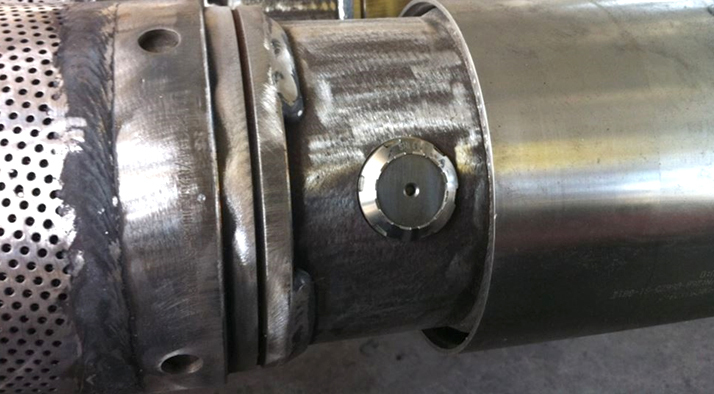 By altering the strength and nozzle diameter, the two systems can be compared in greater detail. Quality check the regression coefficients against test data and choose the best fit coefficient data set. The regression coefficient set should be chosen based on which set gives the best fit for the actual field conditions, i.e. water control versus gas control or both. Usually the Multi-Variable Non-linear Regression (MVNL) method is the most rigorous and gives the best overall match. The regression curves should be plotted against real test data and compared for both gas and water control accuracy. In Figure 3 (below) MVNL coefficients better match the real test data and would be the choice for future simulations. Figure 3 – Comparison between test data (thick lines), linear (LIN) and multi-variable non-linear (MVNL) regression. The methods described above have been successfully implemented to evaluate autonomous versus passive ICDs in several large field developments. Some stability problems were reported in the reservoir simulators and several suggestions have been made on how to improve the stability. Setting annular flow in the completion annulus to zero when running the reservoir simulator seems to improve stability and create results often verifiable by steady-state simulators like NETool. With ICDs or AICDs, annular flow is zero across the reservoir block such that the error by switching off annular flow can be disregarded. The flowing bottom hole pressure during the life of the well should also be compared to a simple NETool style steady state simulation to ensure the reservoir simulator is in fact calculating the pressured drop correctly. 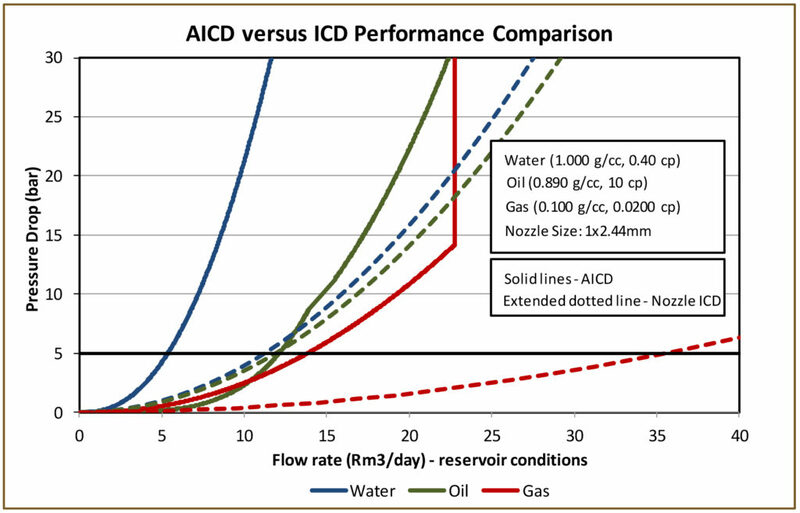 Unless the bottom hole viscosity of oil and water is the same, an AICD should always outperform a passive ICD system. Ensuring sufficient hydraulics capacity for total liquids over the life of the well is important when running these simulations. 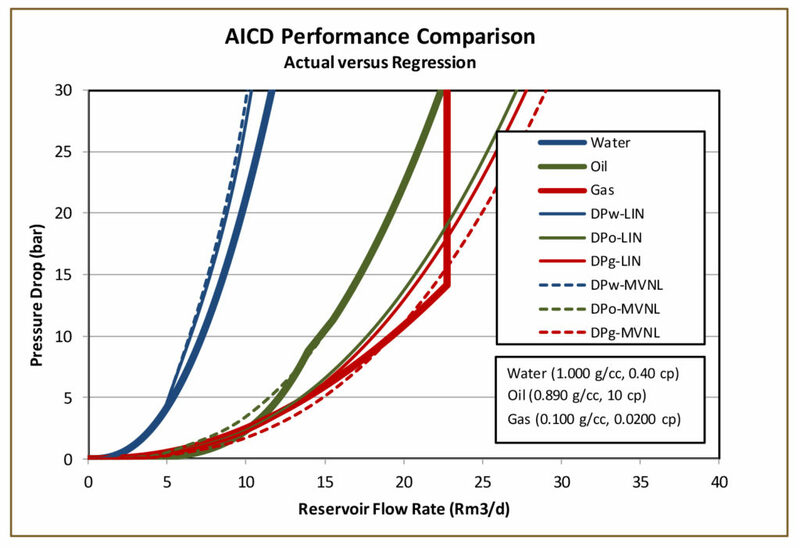 As the reservoir engineers become more comfortable with the AICD-coefficients and with the ability to scale up and down for meeting the required flux rate, there should be a major increase in AICD completions, similar to that experienced over the last 20 years with the passive ICD systems.